Nintendo’s Miitomo app is available on Google Play, bringing the fun of building your own Mii directly to your smartphone. Once a Mii character is built, you can socialize your Mii with your friend’s Mii, sharing photos and even asking questions. To get started, you need a Nintendo account, then link your account to the Miitomo app. Once linked, you will begin to create your Mii. 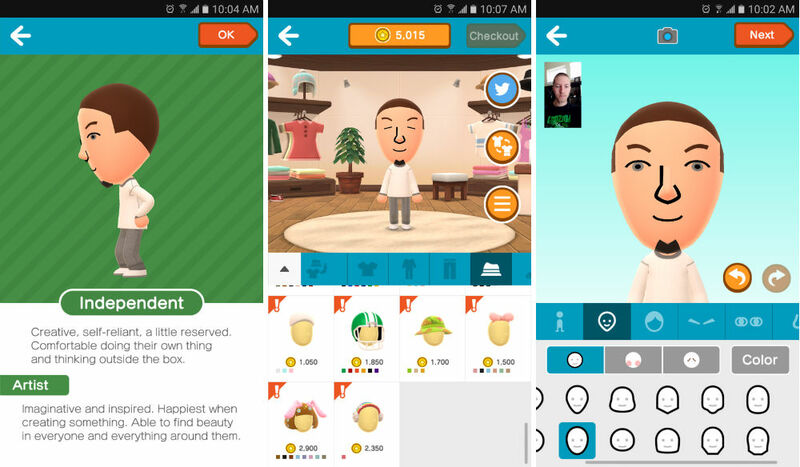 To do so, snap a quick selfie, and the app will generate a basic Mii character for you. You can then further customize your character to make it look just like yourself. Once your character is all set, it’s time to socialize. In order to socialize, you will need friends. If Miitomo is an app you want to have fun with, you better get your friends to sign up. Now, I don’t expect anyone over the age of 18 to enjoy this app, but if you are a younger person, the app could be fun. Your Mii character will ask you questions, and answers will be shared to your friends. When you answer questions, you earn coins. These coins can be used to buy new clothes and other goodies. The app is completely free to use, but there are IAPs for purchasing more coins and basic items.